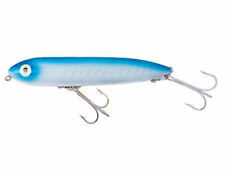 Rapala Skitter Walk SW-8 lure. Type: Topwater, Rattle, Walk the Dog. Color: Shad Translucent. Rapala Skitter Walk 08 Fishing Lure. Blue Mullet. Camping & Hiking. Hunting & Tactical. 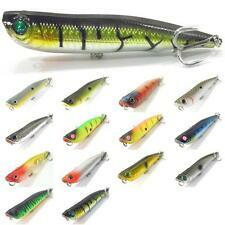 Lure Length: 3 1/8" | Lure Weight: 7/16 oz. Superior construction assures a perfect swimming bait right-out-of-the-box. This Popper lure is very effective for bass fishing. It will also work for all predatory fish like Mackerel, Pike, Zander, Pollock. 8.5CM 19G Popper Lure. Weight: 19G. Size : 8.5cm. 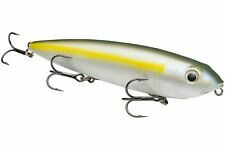 Rapala Skitter Walk Color: Gold Mullet Size: 08 Swimming Depth: Topwater Body Length: 3 1/8" Two No. 3 Treble Hooks. Savage Gear 3D Topwater Duck Bait Color: Yellow Weight: 1 oz Running Depth: Floats Size: 4-1/4" Extra Tail Included. This smaller version is made tough to battle bigger foes. Ice Fishing. Check-Out Now! Fishing Line. John B Outdoors looks forward to serving you. What happens after I have paid for my item?. We are located in Stuart Florida. Cotton Cordell 6" Pencil Popper 1 oz Fishing Lure. The Cotton Cordell Pencil Popper is one of the most underrated topwater baits on the market. Hunting & Tactical. Shin Guards. Lure Length: 6". Elbow, Knee & Ankle Guards. Rapala Skitter Walk 08 Fishing Lure. Holographic Silver. Camping & Hiking. Hunting & Tactical. 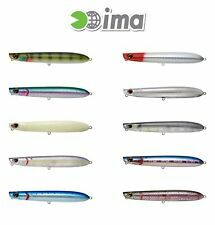 Lure Length: 3 1/8" | Lure Weight: 7/16 oz. Superior construction assures a perfect swimming bait right-out-of-the-box. 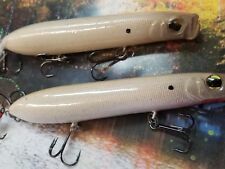 Rapala Original Floating Minnow Fishing Lures F05 CHOOSE YOUR COLOR!! Savage Gear 3D Suicide Duck Color: Wood Duckling Size: 4-1/4" Weight: 1 oz Floats. Rapala Skitter Walk Color: Hot Chartreuse Size: 08 Swimming Depth: Topwater Body Length: 3 1/8" Two No. 3 Treble Hooks. The model number is R1100 with a color code of PGSH (Prism Ghost Shad). The Yo-zuri 3DB Pencil is a top-of-the-line, easy to work, “Walk the Dog” style topwater lure. It also features Yo-Zuri's Internationally Patented Internal 3D Prism Finish and the Wave Motion technology (ribs on the belly of the lure which create vibration to attract predators) that is the hallmark of the 3DB series of baits.